You are here: Home » Blog » Blog » Disney Dining » Best Places to Propose at Walt Disney World! Disney Engagement! Best Places to Propose at Walt Disney World! Disney Engagement! With Valentine’s Day right around the corner this is the perfect time to talk about love! Love brightens our days and fills our lives with joy! One of the best places to celebrate love is Walt Disney World! The Disney parks are known as a wonderful family destination but it is also a very romantic destination. There are so many things at Disney for couples to enjoy! From Food and Wine Festivals to recreation of every kind, the date ideas are truly endless! After all Disney teaches us in so many of their stories that true love conquers all! 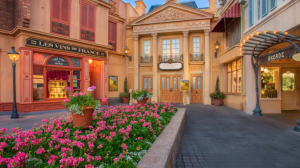 So many places within Disney World provide such a beautiful romantic backdrop, that’s why Disney World is one of the best places to get engaged! For any Disney loving couple a Disney proposal will be a fairytale come true and the perfect start to your very own happily ever after! Once you have decided to pop the question in Walt Disney World, it is time to decide where exactly you want to get down on one knee. 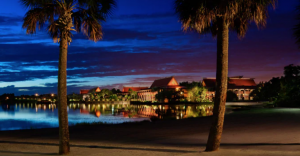 Everyone know that the Walt Disney World Resort is huge, with 4 theme parks, 2 water parks, Disney Springs and over 30 resort hotels, you have a wide array of proposal locations to choose from. Wherever you choose to get engaged it is sure to be a very special and magical moment! If you are looking for some ideas here are 5 proposal locations suggestions! 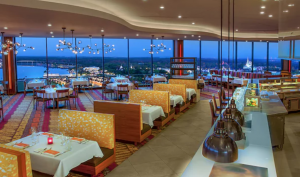 The California Grill is a signature dining restaurant located on the top floor of Disney’s Contemporary Resort. The restaurant is beautifully decorated in a sleek, modern style. Floor to ceiling glass windows encase the restaurant, perfectly showcasing the breathtaking views that makes this dining establishment an icon! From the Cali Grill, you get a birds-eye view of the Magic Kingdom Park! You can watch the sunset over Disney’s Seven Seas lagoon and watch the monorails wiz past below you. On the opposite side of the restaurant you can watch the Disney watercrafts cruise around Bay Lake and in the distance, see the icons of Epcot, Hollywood Studios and Animal Kingdom! This restaurant has 4 outdoor observation decks, one on each corner of the restaurant. From these decks you can truly appreciate those jaw-dropping views. These decks are also one of the best spots on property to watch the Magic Kingdom Fireworks! Seeing the show from this unique location is very romantic! The California Grill is an amazing proposal spot! You can choose to propose over dinner or make the moment more intimate by going out on one of the observation decks! 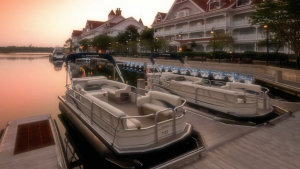 Disney’s Grand Floridian Resort and Spa and Disney’s Polynesian Village Resort are both beautiful deluxe Disney Resort hotels that sit just off the shores of the Seven Seas Lagoon (the body of water that leads across to the Magic Kingdom.) Both of these resorts feature gorgeous white sand beaches that are very peaceful and romantic. Take your loved one for a walk down to the beach, find a quite spot and pop the question! These beaches are a wonderful proposal spot because they are secluded yet still in the middle of the Disney magic! From any of the beaches you can see Cinderella’s Castle in the distance! So Magical! This location is also a great spot to view the Magic Kingdom fireworks. If you want you could even plan to propose here at nighttime during the fireworks! 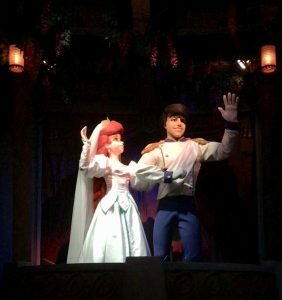 If you are looking to make more of a public proclamation of your love you can do the classic showstopper and get down on one knee right in front of Cinderella’s Castle in the heart of the Magic Kingdom! Proposing in front of the most iconic location in all of Disney World always grabs the attention of a large crowd. I have seen proposals in front of the castle before and all the surrounding guests always stop in their tracks to cheer for the newly engaged couple! This proposal idea is definitely an energetic one and a great one if you are looking for the theatrics of it all! You will absolutely make your partner feel like royalty! If the pomp and circumstance isn’t necessarily your thing but you still want to propose by Cinderella’s Castle there are some more intimate alternatives. To the right-hand side of the castle there is a pathway that has a wishing well. Proposing here is a little more private than right in front of the castle but yet you still get that castle backdrop! World Showcase at Epcot allows you to travel the world without a passport! You can visit pavilions that represent countries from all over the globe! If you have visited Epcot before then you know how beautiful the World Showcase is! There is so much to explore and so many great tucked away spots that could make for a perfect proposal setting. I would suggest taking a stroll around the world showcase together and when you find that perfect spot that it just right, make that the moment you get down on one knee! To give you a couple location ideas there is a beautiful waterfall that is hidden away at the very top of the stairs in the back of the Canada pavilion. There is also a bridge in front of the Italy Pavilion near the gondolas that is typically a quiet and beautiful location overlooking the World Showcase Lagoon. Sometime you may even get lucky and there is a Disney PhotoPass photographer in this area who would be able to capture the moment! No, we are not talking Disney busses or monorails, we are talking about a more personal and private transportation experience. Did you know you can book a romantic carriage ride at either Disney’s Fort Wilderness Campground or Disney’s Port Orleans Riverside Resort! How romantic would an evening carriage ride be around the grounds of a beautifully landscaped Disney Resort for your special moment! Another Disney transportation experience would be to book a Disney fireworks boat cruise! This experience can happen at either Seven Seas Lagoon for the Magic Kingdom fireworks or at World Showcase Lagoon for the Epcot fireworks. This would make for a very romantic and intimate setting to propose. Hope these suggestions get you inspired for your own Walt Disney World proposal! As always, your Kingdom Magic vacations Travel Planner is ready to help you plan your Next Disney Vacation! Our knowledgeable team can help you make arrangements for reservations or other proposal details and extras! This entry was posted in Disney Dining, Disney Fairy Tale Weddings, Disney Parks, Disney Resorts, Disney Restaurants, Disney Transportation, Disney Vacation, Epcot, Magic Kingdom, Walt Disney World, Walt Disney World Resort - Orlando and tagged disney engagement, disney proposal, disney valentines day, disney world, disney world engagement, disney world proposal, enagement, just engaged, proposal on February 5, 2019 by Megan Przychodzien.